I took a bit of a Hiatous from blogging after the tournement, but i have kept on playing and the reports are on their way. But before i start with them i would like to talk you through some of my thoughts on Makeda. First, let's have a look at my Makeda list. What have i learned from the past few months of playing her excessively? Quite a lot actually. I have said since i started playing the list, and i'm still confident that she is one of our absolute best casters. On paper, the list might not seem like much, but on the table, she just covers so much ground, it's almost too good to be true. What's her main strengths? Well, unlike most of our other lists, she can play into, and outright crush most of the heavy gunlines that seems to riddle the current worldwide Meta nowadays. With the exception of Caine2, the high native defensive stats of the Ferox, combined with elements like Tough, Stay Death, Native steady, Deflection (If that is more valuable than Stay Death, which most of the time it's not i think), Dodge, Terrain.. The list goes on. Their high speed, and the fact that they are impossible to stop if you can't outright remove them, means that most shooting lists will have a really hard time dealing with them. They remove infantry like nobodys business (only outdone by the Void Spirit bullet with Mordikaar), Demolish all other cavalry in the game due to longer threatranges and a high enough damage output to cripple them, and they can take on Lights, and even heavies under the right circumstanses. Makeda pretty much just run every single turn, almost never casting any spells, but why should she? Stay Death is too good an ability to not use, and with her Spell list being good, but not awesome, she only ever need to do anything other than making sure she's near enough to the fray to help the Ferox survie, and to use her Feat and Spells should the need arise (Storm Rager and Dash are amazing assasination spells), while also keeping herself safe from retaliation. By clearing all chances of him contesting me in his T2, i can quickly move to a Scenario lead. 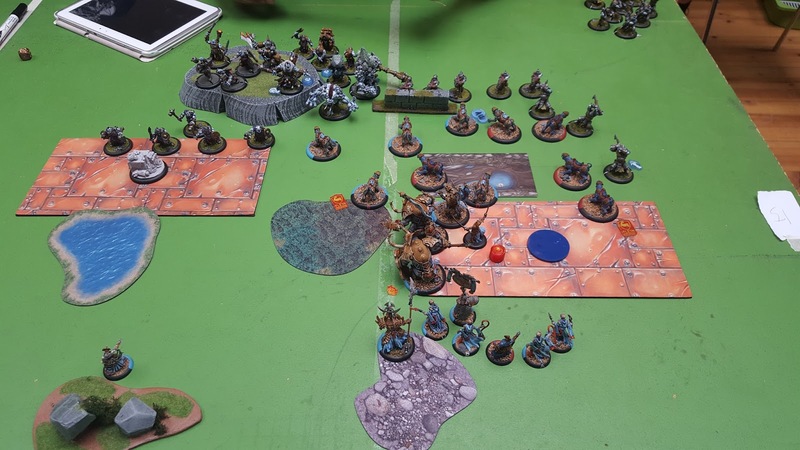 He could move everything over to his own zone to start scoring, but by doing that, he would leave himself open to assasinations (Not enough models to block my path to his caster) or, if he chose to not try and do something at all with Ferox, he would give me a second alpha strike. Or he can forgo the Scenario and try to deal damage to me, but again, that's not an easy feat, as i can use the Speed of Ferox to make it really hard for him to deal serious damage to me. I do this by using the Terrain, and my positioning to limit the amount of models he can reach. Best case scenario for him is to kill the two Ferox closest to his Beasts and the one that's partly in the Forest, and that is if he hits with all his attacks, and gets through my ARM and i fail all, or most of my tough Checks. Secondly, she does Atrition exceptionally well. With all the punch i can bring with Ferox, Beasts, Radheim and TyCom, and how much punch the opponent needs to grind through the wall of Ferox, i will start to grind out any infantry heavy list out there. I always get to strike first, that's pretty much a given. Shooting lists get one, or maybe two rounds of shooting before i'm in his face, and they usually lack the melee punch to clear the Ferox once the Jam is real. Since i get to strike first, with the surgical presicion of the Ferox, i can put the hurt on where it's needed the most, taking out important elements of the enemy's list before he gets to strike (almost as if i had brought a shooting list). Most of the time, this means that his counter punch is limited, putting me on the upper side of the attrition game. 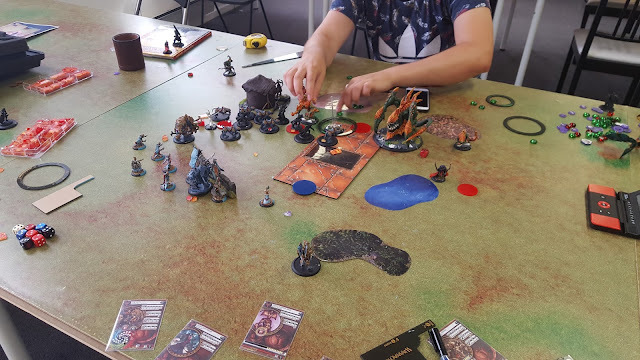 Legion have started the game fairly agresively, but due to the insane range of the Ferox he's a bit further back than he probably would have been. I push back, taking care to stay outside of his threats, but also positioning myself to punish him if he decide to advance further. Legion tries a halfhearted push due to the fear of what i can do on my alpha. Ferox commits, Jams and kill several important pieces (Hellmouth tentacles, shooty solo, a couple of beasts, and i start scoring. 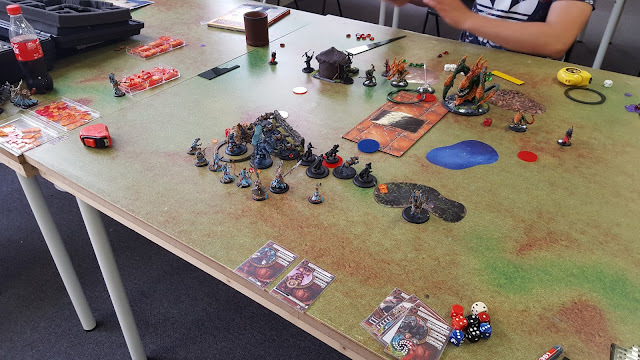 Legion counters with everything he got, but due to the removal of some key models the previous turn, i'm still up on attrition even after i lose several Ferox. Which means that i can charge in with the rest of my army and clear out pretty much anything of value. Legion have nothing left that can threaten me at this point, and the game is won. So, we know that Kittyspam can deal with both attrition and Scenario play, and force your opponent on the clock. Is it deadly on assassinations as well? Well.. ofcourse! It's probably one of the assassination lists it's hardest to stop. 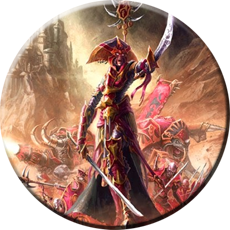 Skorne have always been Assassination specialists. 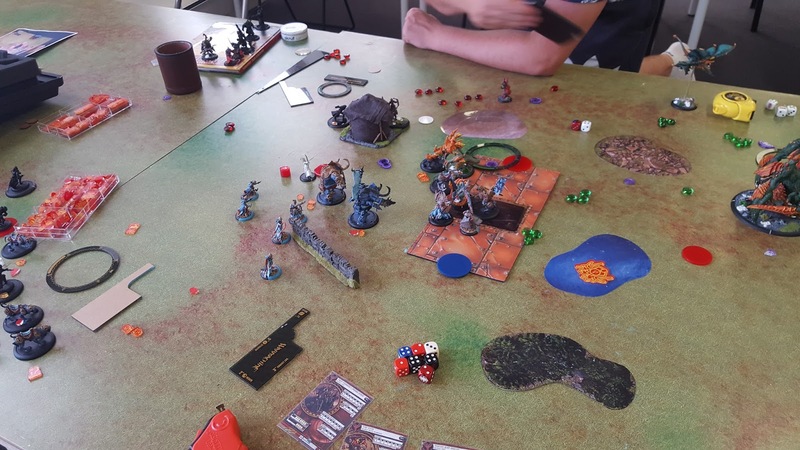 Whether it's been throwing your casters around like ragdolls to spell sling your opponent to death (Zaal2/Rasheth), Negating life sustaining tech like transferin (Morghoul1) or the good old Molik Missile (Severelly toned down in the edition change unfortunatelly), Skorne allways have an angle. And this list is no different. The mobility and punch of Ferox, especially combined with Boosted attacks from Makedas feat, Dash to ignore free strikes, and a bit extra movement, and a Storm Ragered Radheim that's terrifying to pretty much everything in the game means certain death to pretty much anyone that's not extremelly careful. And with the attrition and Scenario game mentioned above, and time pressure, mistakes can and will happen. Even from experienced players. All in all, it's a list that takes a lot of practice to master (i'm 30+ games in and doesn't even feel close to mastering it), but the reward of all the hard work is a list that can put the fear of death into pretty much any caster in the game, and that's something that i believe Skorne has lacked for a long time. So, we know Makeda's strengths. What about her weaknesses? As i mentioned above. ARM skews can be a problem. Ferox hits hard, there's no doubt about it. Skorne Beasts still hits like a ton of Bricks, and with the screening wall of Ferox, they have little problem getting to where they need to be, even against fast or shooty lists, something that's a bit of a problem for our beast bricks. The tyrants (Radheim and Commander) pack a solid punch as well, but against armies with mass bricks of 'Jacks, High ARM infantry or a combination, there's often not enough punch to get through. In games like that, it's more important than ever to get the head start on the Scenario. If you can't punch through, just block it. Focusing on a few pieces at a time. I've seen Ferox grind down an Arcane Shielded Stormwall. Everything's possible, it just takes time, and Buying time is something this list most definatelly can do! High amounts of quality attacks can also be a real problem. If damage is spread around most of the Ferox early, the grind can quickly turn into a real struggle as Tough Checks and Stay Deaths is forced out more and more often. This list thrives on presenting as few targets as possible to Jam, then switching the Jammers with fresh ones after the next push. High amounts of attacks that can threaten me even when you Jam, can be a real problem. And Grievous Wounds shut down every defensive tech this list have. I tried to negate these weaknesses in my list pair via Xerxis1 with a Beast brick to end all Beast Bricks. ARM skews were clearly no problem anymore, and the high amounts of ARM meant that most Shooting lists would struggle breaking through. And Grievous Wounds would not be too much of a problem. 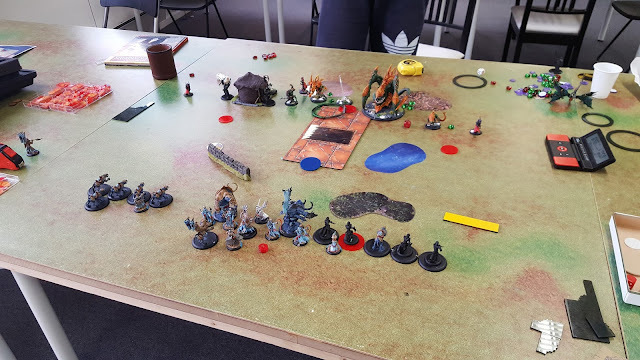 I still can't heal my beasts if he cripples them, but even if i lose a beast or two, The rest still hit like champs, destroying most things sent agains me in return. But the fact that it's a list with few threat extenders, and Xerxis' low control range means that it's often far too slow. Losing me ground on Scenario, and faring even worse than Makeda on Scenarios that force you to spread out. It covers several of her bad matches, but Struggles with several of the same things that she does. Especially things like Caine2, that both threatens to cripple you With Grievous, but also have enough mobility to absolutelly destroy you on scenario if you can't stop him, and that can be pretty hard when you're as slow as this. In short, i needed something else to pair with the Queen of Tyrants. Something that can reliably deal with ARM skews, but was still mobile enough to stop Scenario threats that arises. I have given the subject a lot of thought latelly, and come up with a wide assortment of lists that i'm in the process of testing. I'll leave the complete walkthrough of them to a later date as this post is allready starting to run a little long, but i'll at least post them here, so you guys can read and maybe even try them out. 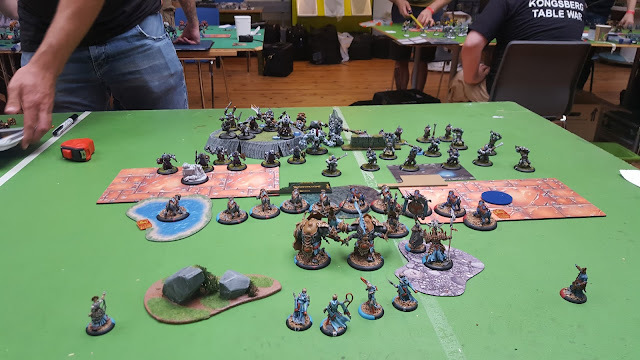 Feedback is always appreciated, and i made this blog in large part to help Skorne as a community to punch through all the negativity that's been all around since Mk3 dropped. Good old Cetrati keep the Brickyness alive with Agonizer, FEAT and Defenders ward to back them up. Ferox speeds the list up drastically, Acting more as Jammers in this variant, with the added benefit of being able to cripple mostly anything with Stir the Blood+Feat. Even Cetrati can move pretty quickly up the board even under Shield Wall thanks to Tactical Supremacy. Scenario becomes less of an issue due to the added speed. The Zaadesh package both grants speed in the Form of Rush, and width of play due to their ability to stray away from Morghoul should the need arise. PGTM and Bloodrunners can Jam and pick away key solos. Most importantly though, With Abuse and Rush, even the Soldiers threaten pretty far, and can kill pretty much anything. 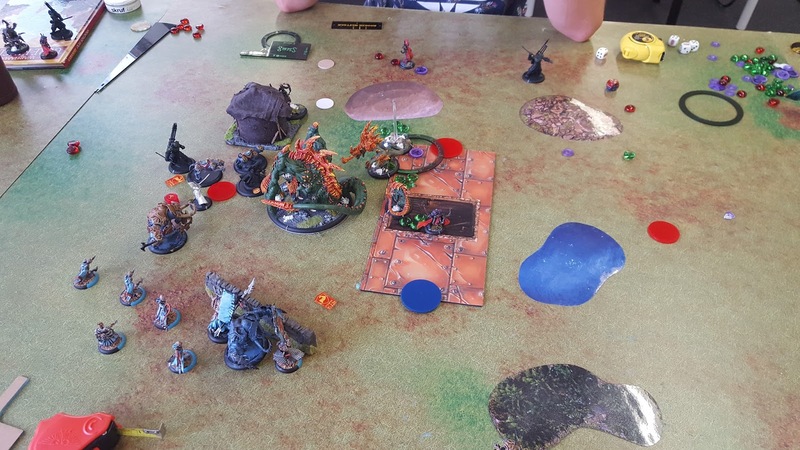 Morghouls Feat negates any sort of alpha strike made by Beast/Jack heavy lists, granting me either a Ping-Ping, or at least a Pon-Ping effect (Again, read through This blog post for clarification). The Cannoneers and Reivers can crack ARM pretty well, Shaman and Raider adds Solo Removal tools, and mobility. The Shaman in Particular can be pretty scary, and a utility piece with it's ability to cast Rush if need be, or removing enemy upkeeps with Spirit Blade. I have considered dropping the Cannoneers and Cyclopes to add a Mammoth with some support instead. I'll test it out a bit and see. Either way, this list will probably not see the tournement scene for me in a long time, as i really can't afford the monetary investement to buy the models.. And the Dakar isn't even out yet. Hope you guys have njoyed this write up. More reports will come soon. But untill then, Keep up the fight for the Empire, and never give up! Through suffering our strength will grow and overcome any obstacles! Great writeup! I love the in-game shots as examples of how to manage opponents and scenario. 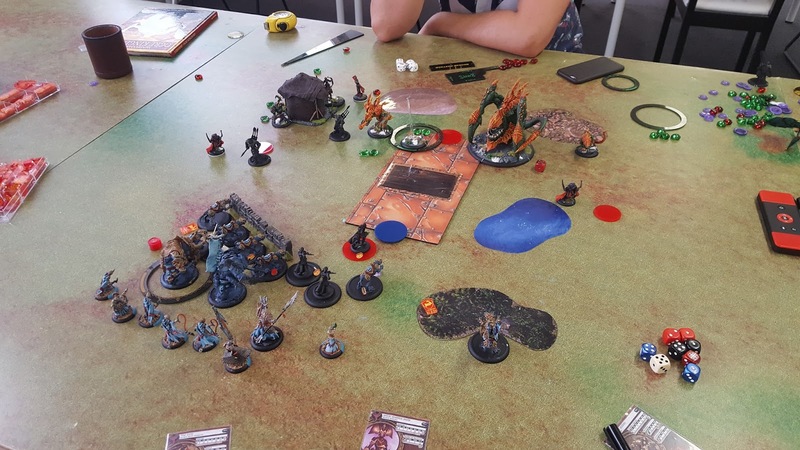 Makeda 2 double Ferox really is one of the hardest questions we can ask an opponent right now. I'm leaning toward the Morghoul list as the pairing personally, because his Feat and Admonition are so good against 'jack lines. Shooty eHexy is also great though. Keep up the reports! I may have to pick up some reivers and try out that shooting list. Thanks again and keep the reports coming!